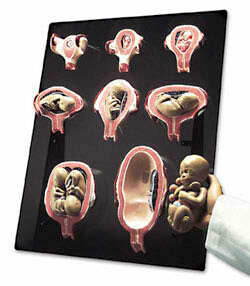 Chronological series of nine enlarged embryological models - total of 17 numbered parts with key card. 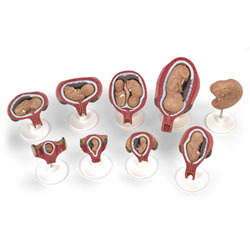 There’s no better way to depict the actual size and developmental stages of a fetus than with these incredibly realistic replicas! 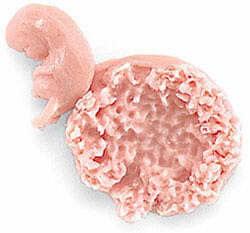 A thorough multimedia program, this kit presents an in-depth look at embryo and fetus development in humans. The accompanying text and teaching guide provide background information and study questions and include transparencies and blackline masters. The DVD titled The Miracle of Life, along with the transparencies, tells the fascinating story of embryonic and fetal growth. 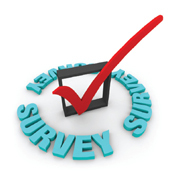 The blackline masters highlight important study points for students. 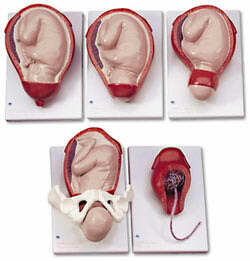 The dramatic Life/form® reproductions were molded from specimens and show the stages of human development in a unique, innovative way…through plastic models and replicas each student can examine and study. 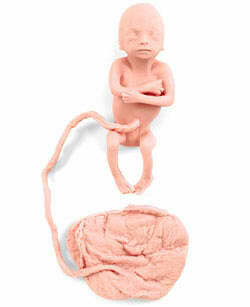 The kit offers a direct and complete approach to an understanding of human reproduction from fertilization to birth. 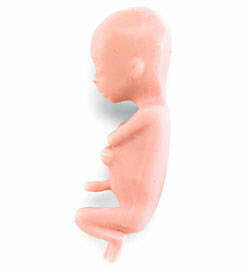 Nine realistic Life/form® reproductions, four models of the early stages of the embryo, five actual replicas of the growing fetus, plus The Miracle of Life DVD and detailed text and teaching guide with 13 transparencies and 12 blackline masters. 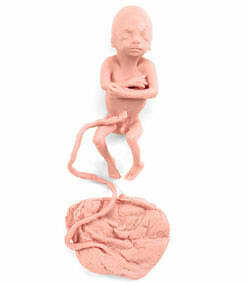 Add dramatic realism to the study of prenatal human development. 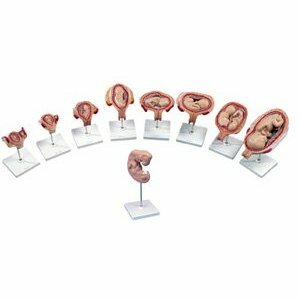 Replica is an actual reproduction, and offers an accurate and exciting way to study external development and growth of the fetus. Teaching guide included. Three year warranty. 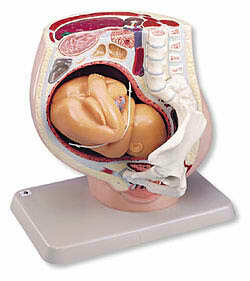 This unique three-dimensional model is used to demonstrate palpation of the abdomen to determine fetal lie, presentation, and position. 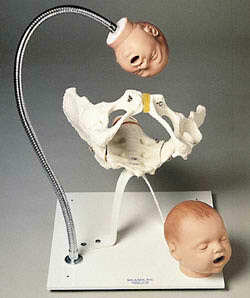 A female pelvis and two fetal heads designed to demonstrate the birth process. The two interchangeable heads, one full term, the other premature, are fastened to a flexible shaft to allow passage, in different positions, through the pelvic outlet. 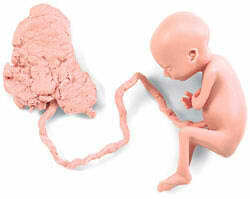 Both fetal heads contain skulls with palpable cranial sutures and anterior and posterior fontanels. The models can also be used in demonstrating forceps and vacuum assisted deliveries. Size: 16" x 16" x 13". 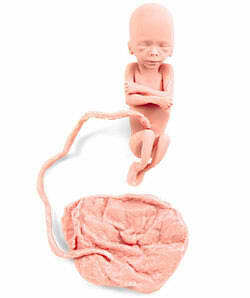 This exciting set of products brings any prenatal education program to life. 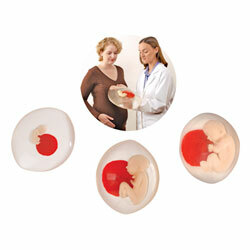 Three soft, palpable fetal models represent different developmental stages of pregnancy. Reviewing development from conception to 6 weeks postpartum is made easy with the accompanying “With Child” Life-Size Display. 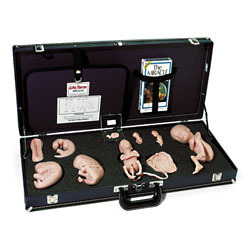 Set includes three fetal models (3-1/2, 7, and 9 month), “With Child” Life-Size Display (18" x 24"), and carrying case on wheels.